One of the most important techniques of feature extraction, i.e., the minor component analysis (MCA), has been widely employed in the field of data analysis. In order to meet the demands of real time computing and curtail the computational complexity, one instrument is often applied, namely, the MCA neural networks, whose learning algorithm, under some conditions, however, can produce complex dynamic behaviors, such as periodical oscillation, bifurcation, and chaos. This article introduces the chaotic dynamics theory to fully and correctly comprehend the numerical instability and chaos of iterative solutions in the MCA. Especially, as an illustration, the Douglas' MCA chaos control is discussed in details, where a stability transformation method (STM) of chaos feedback control is used in the MCA convergence control. As the time series diagrams, Jacobian matrix and Lyapunov exponent of discrete dynamic system indicate, the desired fixed points of iterative map of Douglas' MCA can be captured and the chaotic behavior of the algorithm can be controlled in the original chaotic interval. Minor component is the small eigenvalue of the correlation matrix corresponding to the input dataset, and the MCA is an important technique for data analysis. It can extract the key features of data and its neural network can be used to extract minor components without calculating the correlation matrix advance, which makes it an ideal method to decrease the computational complexity and thus to be broadly applied in real time applications of data analysis and signal processing , such as moving target indication , curve and surface fitting , total least squares (TLS) , clutter cancellation , frequency estimation , digital beamforming , etc. Recently, some MCA learning algorithm are proposed to update the net weights, such as Douglas's algorithm, where abundant chaos phenomena are detected . MCA learning algorithms usually are described by stochastic discrete time (SDT) systems, but it is very difficult to investigate the convergence of the SDT models directly . Consequently, deterministic continuous time (DCT) system associated with the SDT model is analyzed . Furthermore, because of computational round-off limitations and tracking requirements, the condition corresponding to stochastic approximation theorem can not be satisfied in application easily, so that the convergence of original algorithm can be interpreted by examining a deterministic discrete time (DDT) system. Actually, the convergence issue of MCA algorithm has been explored according to the corresponding DDT system [1, 11–13]. On the other side, in essence, the iterative algorithm of nonlinear system xk+1= f(x k ) is a discrete dynamic system. From the chaotic dynamics theory, a dynamic system can produce the instability phenomena of divergence, periodic oscillation, bifurcation, and chaos, if the eigenvalues of the Jacobian matrix of dynamical system satisfy certain condition [14, 15]. In essence, a nonlinear iterative map is generated by the MCA neural network algorithm, which within different parameter intervals can exhibit different behaviors, where, under some conditions typical chaos phenomena are displayed . Recently there has been an increased interest in the analysis of the relevant issues [8, 16, 17]. The chaos theory is applied to fully understand the convergent failure of periodical oscillation and chaos and chaos of iterative solution [18–20]. As one of MCA algorithm, Douglas's MCA algorithm can lay out the most properties of MCA algorithms. Therefore, we will obtain general MCA analysis result and extend the properties based on the study of this algorithm. The article discusses in different aspects the causes of some chaos phenomena in Douglas' MCA algorithm. Then on the basis of chaos control principle, the stability transformation method (STM)  is applied to control the Douglas' MCA chaos and thus stable convergence solution can be achieved. Specifically, the unstable fixed points embedded in the periodic and chaos orbit of the MCA dynamical system are stabilized by STM, the results of numerical simulation have been demonstrated. The control results are demonstrated with the Lyapunov exponent, time series, and bifurcation diagrams of Douglas' MCA algorithm. The contributions of this article are shown as follows: (1) The chaotic behaviors of Douglas's MCA are controlled by a kind of chaos control method in the original chaotic interval, i.e., STM, moreover, some intrinsic reasons of symmetry phenomena are revealed; (2) via studying Douglas's MCA, we can obtain more effective numerical results and general achievement, which can provide some insights to chaos phenomena existing in most of MCA algorithms. The article is organized as follows. Basic chaos theory and STM are introduced in Section 2. In Section 3, the chaotic dynamic behaviors of Douglas's MCA algorithm are described, and the essential reasons of chaos phenomena are analyzed. The numerical analysis and illustration of chaos control of Douglas's MCA with STM are presented in Section 4. Finally, conclusions are drawn in Section 5. Chaotic behaviors are observed widely in the physical world and natural systems, which attracted abundant attention from different fields after mid-20th century [17, 19]. Chaos theory is a scientific theory describing erratic behaviors in certain nonlinear dynamical systems and provide new theoretical and conceptual methods to comprehend the chaos phenomenon. where x is a n × 1 dimensional state vector and p is a control parameter vector of the dynamic system. If LE < 0, the system is conservative and convergence, elements of the phase space will stay the same along a trajectory, and the trajectory is stable corresponding to the periodic motion or a fixed point. If LE > 0, the system is dissipative and divergent, the trajectory is unstable, and the nearby trajectories depart in exponential way, and form the chaotic attractor. Therefore, Lyapunov exponent LE can be used as an index to identify the dynamic behavior and the chaotic degree of strange attractor. Moreover, If LE = 0, then the trajectory is in the stable border and bifurcation state. The Lyapunov exponent changing from negative to positive means the transition of periodic motion to chaos . Furthermore, another important numerical method to identify the chaotic phenomena of non-linear dynamic system is Jacobian matrix. Jacobian matrix is the matrix of all first-order partial derivatives of a vector-valued function J ( J = ∂ f ∂ x | x k ) and can represent the best linear approximation to a differentiable function near a given point. It is generally be utilized to judge the non-convergence phenomena. Further, When the spectral radius of the Jacobian matrix of the dynamical system (1) is smaller than 1, i.e., ρ(J) < 1, the convergence of dynamical system can be obtained and the fixed point is attracted. If the spectral radius of Jacobian matrix of dynamical system (1) is larger than 1, i.e., ρ(J) > 1, the fixed point will lose its attracting property in the specific parameter interval and the dynamical system produces instability. After a few iterations, the iterative solutions could present the non-convergence phenomena, such as periodic oscillation, bifurcation, and even chaos. 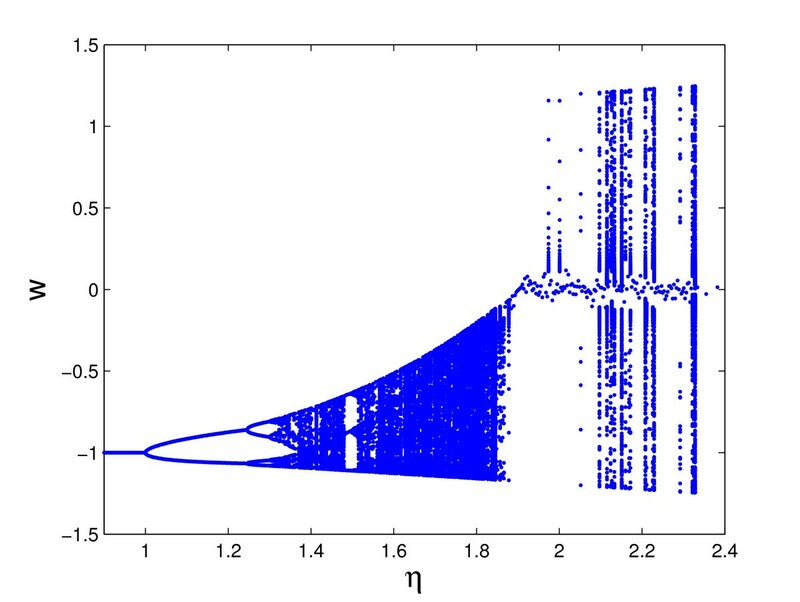 As mentioned in Section 2.1, when Jacobian matrix ρ(J) > 1, the dynamic system (1) will generate numerical instability of periodic oscillation, bifurcation, and chaos. Therefore, in order to obtain fixed points of dynamic system (1), the chaos control methods should be incorporated. The chaos feedback control method can capture the specified fixed points embedded in the chaotic attractor of nonlinear dynamical system through implementing the target guidance and position [15, 21, 22]. At the same time, it can stabilize the unstable fixed points involved in the periodic orbit of dynamical system, and control the oscillation and bifurcation of the system . in the above, 0 < λ < 1, D is the n × n dimensional involutory matrix. The selection of involutory matrix D in (3) depends on the system's property. To enhance the efficiency of stabilizing the periodic orbit, it is unnecessary to take all the 2 n n! involutory matrices, but it is desirable to select the minimum number of these matrices which is called the minimum set of involutory matrices. Pingel et al. proved that for low dimensional chaotic dynamic system , D is to be chosen from the five following matrices according to the properties of the saddle point and spiral point of the unstable fixed points, and when the λ is set a small enough value, the unstable fixed points can be stabilized. Furthermore, λ is selected according to the eigenvalues of the dynamical system's Jaco-bian matrix. The larger the maximum of the absolute eigenvalues of Jacobian matrix is, the smaller the factor λ should be taken to obtain the stabilization, and consequently the more iterative number is required to reach the convergent solution . the original dynamic system can be controlled when λ ∈ (0,1), when the attractor's stability can be remodeled by the STM and the unstable fixed points are stabilized into the periodic or chaotic orbits. However, if λ = 1, the original dynamic system emerges periodic oscillation and chaos can not be controlled. where, w is a scalar function, and k ≥ 0, all η > 0. A compact set S ⊂ R is called an invariant set of Function (5), if for any w(0) ∈ S, the trajectory of Function (5) starting from w(0) will remain in S for all k ≥ 0. Strictly, if 0 < η ≤ 2.32588, then S is an invariant set of Function (5). Especially, if 1 ≤ η ≤ 2.32588, the Douglas's MCA dynamical system displays the chaotic phenomena illustrated in Figures 1, 2, and 3. Time series of iterative map w ( k ) of Douglas's MCA algorithm w (0) = 0.79622 and η = 1.75. Bifurcation diagram of iterative map of Douglas's MCA algorithm w (0) = 0.7. Bifurcation diagram of iterative map of Douglas's MCA algorithm w (0) = -0.7. Now it is clear that Equation (5) is an odd function. As noted in symmetry in chaos , odd function mapping has a period-doubling cascade, one corresponding to a positive number and the other a negative as the initial point, and the two chaotic attractors spawned by the period-doubling cascades will merge to form one symmetry attractor. The typical phenomena in the dynamics of symmetric mapping are identified and illustrated by the mathematical model of Equation (5). Specifically, it is observed that, trajectories of attractors from the positive value as their initial condition are shown in Figure 2 and the ones from the negative in Figure 3. Moreover, on η, the chaotic attractors are symmetric if their origins are. As is mentioned in Section 2, Jacobian matrix is a powerful approach to judge the non-convergence phenomena of dynamical system . A dynamic system is unstable under the condition that each eigenvalue absolute of the Jacobian matrix is larger than 1. Lv and Zhang  has found that a lot of chaotic behaviors are represented in the interval λ ∈ [1, 2.32588]. Accordingly, we use STM to modify the eigenvalue of Jacobian matrix of Equation (5) under the condition and get the controlled MCA Equation (8) without changing the value and location of unstable fixed points. Clearly, the set of all equilibrium points of (7) is 0,1, -1. For each equilibrium, the eigenvalues of Jacobian matrix at this point is computed. g G d w ( k ) | 0 = 1. Therefore, 0 is unstable point. When 0 < λ < 1 η , it holds that d G d w ( k ) < 1 . Consequently, in the new Jacobian matrix (8) of Equation (7), each of eigenvalue is less than 1 if 0 < λ < 1 η . In summary, we can control chaotic behavior in the original system if 0 < λ < 1 η , and the absolute of eigenvalue of formula (7) is less than 1 when 0 < λ < 1 η . This means that the dynamic system can converge, and the unstable system is transferred to a stable system by using STM. Furthermore, according to the Lyapunov exponent method , we can justify and confirm the results by using STM with the illustration of Lyapunov exponent. As mentioned in Section 2.1, when Lyapunov exponent LE < 0, the system trajectory is stable corresponding to the periodic motion or a fixed point;when LE > 0, it denotes that the system has dynamic behaviors and presents the chaotic phenomena of strange attractor. The Lyapunov exponent's transition from negative to positive indicates the change of periodic motion to chaos. Figures 4 and 5 present the scenarios in which Lyapunov exponent of original MCA algorithm and the Lyapunov exponent of the controlled Douglas's MCA dynamic system by STM separately. In Figure 4, in some intervals of η, the Lyapunov exponent LE is less than 0, while in some intervals, LE is larger than 0 in which the chaotic solutions of MCA algorithm occur. In Figure 5, LE < 0 is presented, which means the chaotic behavior of Douglas's MCA dynamic system has been controlled, and the expected convergent solution of Douglas's MCA is caught. Lyapunov exponents of iterative map of MCA algorithm. Lyapunov exponent of controlled MCA algorithm by STM. In this section, case studies of using the STM are illustrated and the time series results of Douglas' MCA from different starting points are shown in Figures 6, 7, 8, 9, 10, and 11. For each iterative map w, simulated results of an original system are given to be compared with those using STM. It is evident that the chaotic behaviors of the original dynamic system have been controlled by the STM, the unstable fixed points have been transferred to stable points, and the convergence results have been reached in the original chaotic interval. 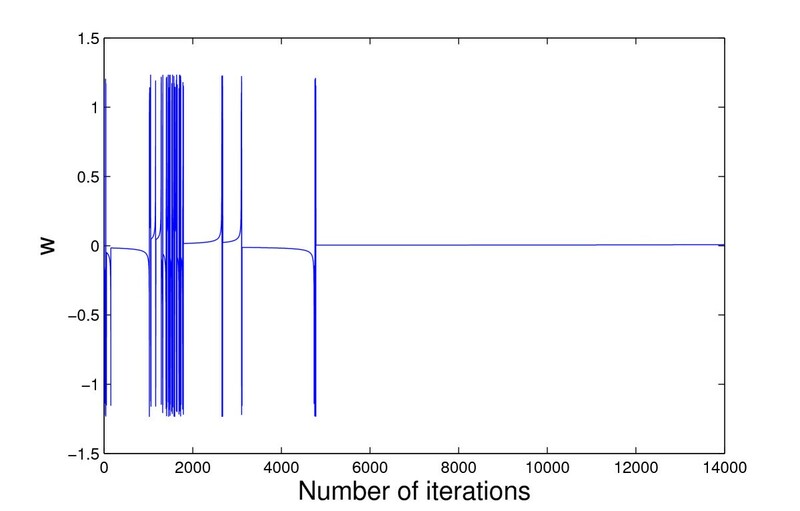 Time series of iterative map w ( k ) of Douglas's MCA algorithm w (0) = 1.15548 η = 1.3. Time series of iterative map of controlled Douglas's MCA algorithm by STM λ = 0.1 η = 1.3 w (0) = 1.15548. Time series of iterative map w ( k ) of Douglas's MCA algorithm w (0) = 1.0783 η = 1.93. Time series of iterative map of controlled Douglas's MCA algorithm by STM λ = 0.1 η = 1.93 w (0) = 1.0783. Time series of iterative map w ( k ) of Douglas's MCA algorithm w (0) = 0.75187 η = 2.25. Time series of iterative map of controlled Douglas's MCA by STM λ = 0.1 η = 2.25 w (0) = 0.75187. Figure 6 illustrates that, when w = 1.15548, η = 1.3, the original MCA system appears the periodic-4 solutions. Moreover, compared with Figures 4 and 6, when η = 1.3, periodic-4solutions appears clearly. 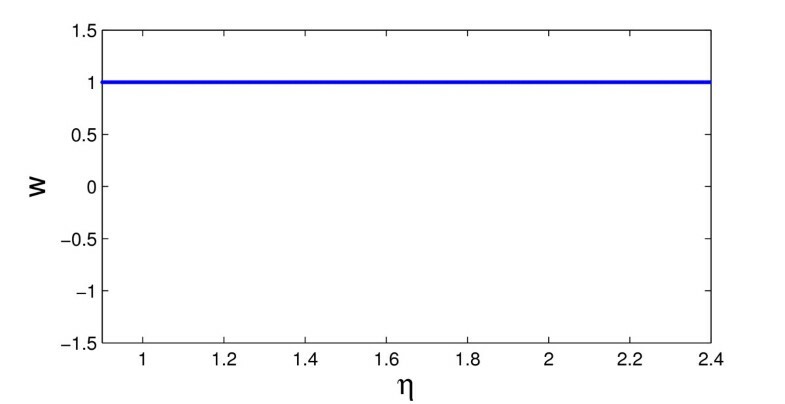 On the other hand, in Figure 4, when η = 1.3, Lyapunov exponent LE > 0, periodic oscillate must occur. Concurrently, the absolute of each eigenvalue of the Jacobian matrix J ¯ < 1 . Hence, Lyapunov exponent and the numerical simulation conducted from Jacobian matrix can justify each other. Figure 7 exhibits that when λ = 0.1, the periodic oscillation of controlled Douglas's MCA algorithm by STM is controlled and a convergence solution is achieved. Figure 8 shows when w = 1.0783, η = 1.93, the original Douglas's MCA system appears chaotic solutions. Figure 9 presents that when λ = 0.1, the chaotic behavior of Douglas's MCA algorithm is controlled. Figure 10 demonstrates that when w = 0.75187, η = 2.25, the original Douglas's MCA system appears chaos phenomena. 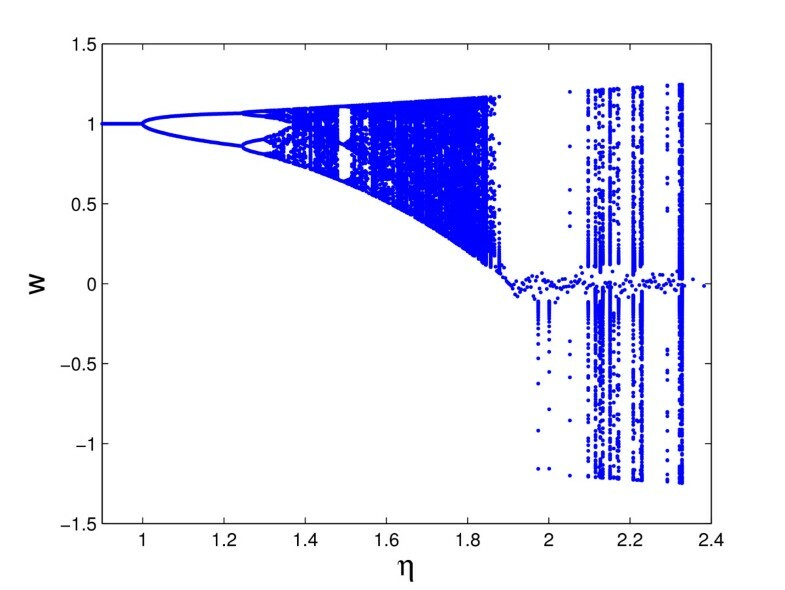 Figure 11 describes for λ = 0.1, the chaotic behavior of the system is controlled. In addition, the bifurcation diagrams of Douglas's MCA algorithm corresponding to different starting points w(0) = 0.6 and w(0) = -0.6 are shown in Figures 12 and 13, respectively. Bifurcation diagram of iterative map of Douglas's MCA algorithm w (0) = 0.6. Bifurcation diagram of iterative map of Douglas's MCA algorithm w (0) = -0.6. Further, applying the STM to the original MCA system, the control results of MCA algorithms with respect to Figures 12 and 13 are exhibited in Figures 14 and 15. Bifurcation diagram of iterative map of controlled Douglas's MCA algorithm by STM w (0) = 0.6. Bifurcation diagram of iterative map of controlled Douglas's MCA algorithm by STM w (0) = -0.6. It is found that STM can obtain the stable convergence solutions of Douglas's MCA algorithm, and control the numerical instability of periodic oscillation, bifurcation and chaos. Besides, it is worth mentioning that, Figures 12, 13, 14, and 15 also has odd function properties which present symmetric attractors. This article focuses on the chaotic dynamics analysis, and especially chaos control of Douglas's minor component analysis algorithm. Periodic oscillation, bifurcation, and chaotic behaviors are discussed on the basis of the chaos theory, and the Lyapunov exponent and the Jacobian matrix reflecting the dynamic property of non-linear system are analyzed. Furthermore, the chaotic phenomena of Douglas' MCA algorithm under some conditions can be controlled and transformed into a stable system with STM of chaos feedback control, and the convergence solutions can be achieved in the original chaotic intervals. Generally, exploring the chaotic dynamic behavior of Douglas's MCA is a good path to understand the essential reasons for the non-convergence in MCA method, and it is helpful to extend the effective application of the MCA and related methods. Moreover, there are lots of non-linear dynamics and chaotic phenomena in real world, a correct and general solution is not easy to achieve. However, the formulation of this article proves that STM is a feasible measurement to the chaotic behavior control of Douglas's MCA in the original chaotic interval, and is a novel method to tackle MCA non-convergence issues. Numerical results demonstrate that STM is a versatile, effective and simple method to control the instabilities and chaos of MCA algorithm. Future study in the area can be conducted to explore the dynamics of other MCA algorithms on a wider and deeper level. This study was supported by Applied Basic Research under Grants 2011JY0118.